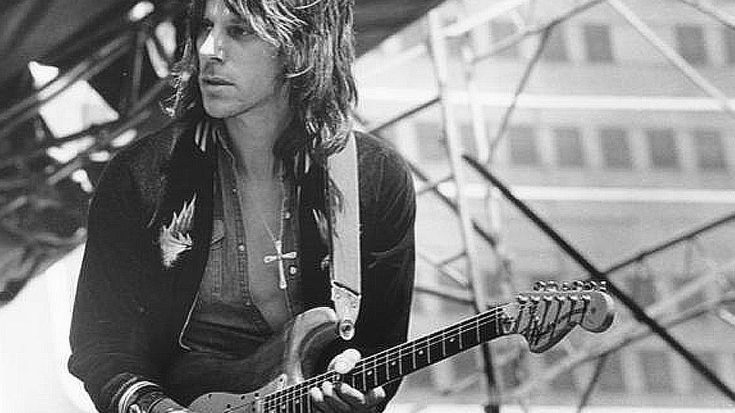 One of the greatest guitar players to ever draw breath, it’s no surprise that former Yardbird Jeff Beck was tapped by New Jersey rocker Jon Bon Jovi to join him on 1990’s “Blaze Of Glory” where he delivered some of the finest guitar work of his career. Written by Bon Jovi after a conversation with Young Guns II star Emilio Estevez made him realize that his own “Wanted Dead Or Alive” didn’t fit with Young Guns II thematically, “Blaze Of Glory” features Beck delivering some seriously delicious guitar work that embodies everything we’ve come to love about the wild west. Fun Fact: “Blaze Of Glory” reached No. 1 on the Billboard Hot 100 and the Mainstream rock chart in 1990, Jon’s only chart-topper away from Bon Jovi. Full of big, sweeping sounds blended with more delicate acoustic and lap steel guitar elements, it’s when Jeff gets to the guitar solo that he takes this Bon Jovi classic and completely makes it his own, dominating with this incredibly raw, fiery sound that makes you want to get on your knees and thank whatever higher power you believe in that Jeff Beck was blessed with such a phenomenal gift and that you’re alive to experience it. Hearing it mixed into “Blaze Of Glory” is one thing, but on its own it’s something else entirely – hear Jeff tearing up this 30 second solo in the audio below, you won’t be disappointed!